We had a great time at Maker Faire KC, met a ton of cool people and saw lots of great exhibits! Unfortunately I had some circumstances beyond my control that kept me out of the booth more than I wanted to be away so if you stopped by and I missed you I am terribly sorry! The booth got crazy busy at times so you might not even know if you missed me so here are some photos to clear stuff up! 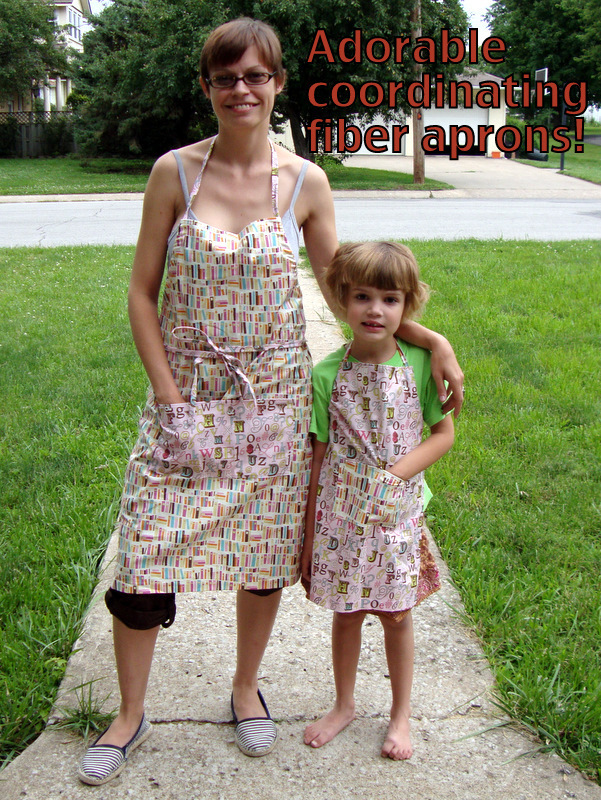 Little E and I got some fantastic coordinating aprons from Gina’s Sew Crazy, not only are they absolutely adorable but they have pockets! We LOVE pockets and they will keep all that fiber fuzz off our clothes. Little E is like any little girl in that she loves to help her momma so now we can blend and spin in style. Boy Wonder & Little E have designed some fiber batts that they will earn the profits from inspired by their favorite video games so watch for those in the next shop update! All the fiber from NGY are perfect for new and experienced spinners and the batts are as smooth as butter and drop spindlers have reported very positive experiences! If you have any questions about the fiber please stop by the group on Ravelry, everyone is super nice and helpful there! A big shout out to Tracy & Cassandra for hanging out this weekend and demo’ing spinning & knitting to all who stopped by the booth, you guys are fantastic! Inventory will start going back into the shop this week including anything left over from the special dyes for the faire including fiber, hand dyed yarns, new crochet and knit kits, and handspun yarns. Also debuting will be the new base, Saucy, which is 55% superwash BFL and 45% silk with a great twist. Walter & Walternate kits are still available and are independent kits and not restricted to any clubs. There was some confusion on this in my absence so if you missed them at Maker Faire you can order them in the shop. If you have sent me a message in the last few days I am working on getting caught up, I will be responding to everyone in the order their messages came in. If you missed Maker Faire or missed saying hi (I am the stereotypically geek with short dark hair and brainy specs wearing nerdy t-shirts) then check out the photo gallery below of some fun moments from the booth! ← Come on out to Maker Faire this weekend!